Thank you to The Woolpack Inn, Coggeshall and Red Fox Brewery for raising a massive £3,325. They raised this money through a golf event at Colne Valley Golf Club on 1st June, of which they had 60 golfers taking part. 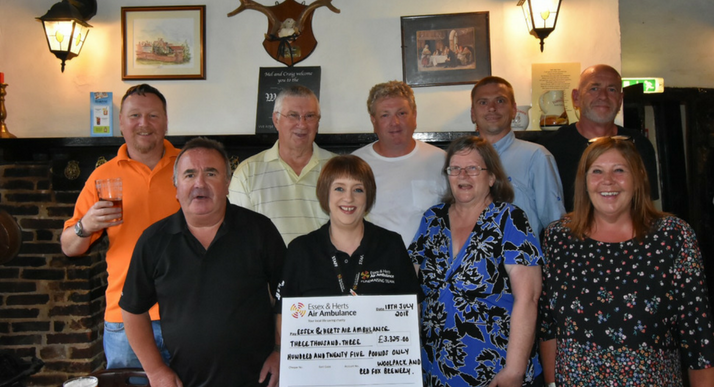 After the golf, there was a buffet, raffle and auction held at The Woolpack Inn. Russ Barnes – Red Fox Brewery, Mel and Craig – The Woolpack Inn, John Hilder – Water Direct, Shaun Graham – GMB Union, Barry Seymour, Graham and Chris Hilder and Clair Mitchell – EHAAT. They are planning on doing another golf day next year and if they raise £2,900 – their total raised since 2011 will be £10,000! Thank you for your support, we can’t fly without you.